British Society of Veterinary Pathology – Superficial pustular dermatosis with acantholysis in a Limousin calf. 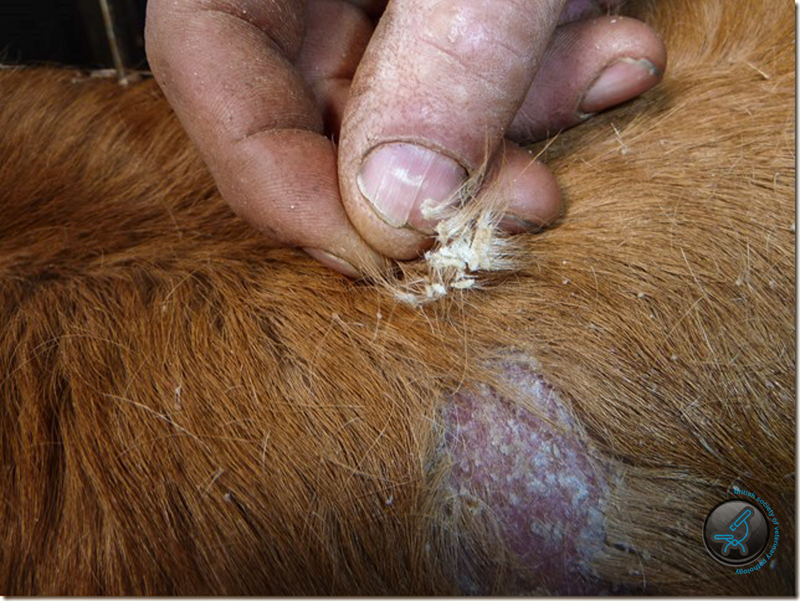 Home / Case Discussions / Superficial pustular dermatosis with acantholysis in a Limousin calf. Superficial pustular dermatosis with acantholysis in a Limousin calf. containing fairly well preserved acantholytic cells and granulocytes. (Figures 4 and 5). 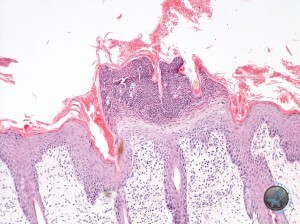 Often the underlying epidermis appeared intact. Sometimes it showed spongiosis, but the acantholysis was frequently very prominent. PAS and Gram stains failed to reveal fungal organisms and bacteria within these pustules. 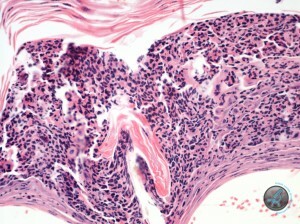 In the dermis there was a mild infiltrate of a few eosinophils, neutrophils, lymphocytes and macrophage. 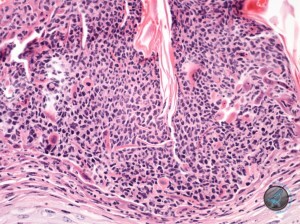 Follicular density is normal and there was prominent anagen activity. No apparent follicular abnormality was detected. Sebaceous glands were present. A diagnosis of Superficial pustular dermatosis with acantholysis was made. Acantholysis is the process where individual keratinocytes separate from one another and round up. It usually indicates failure or immunologic attack directed towards interkeratinocyte adhesion molecules. It can be seen to a limited degree with bacterial and fungal infections. In this case an infectious cause was not identified. 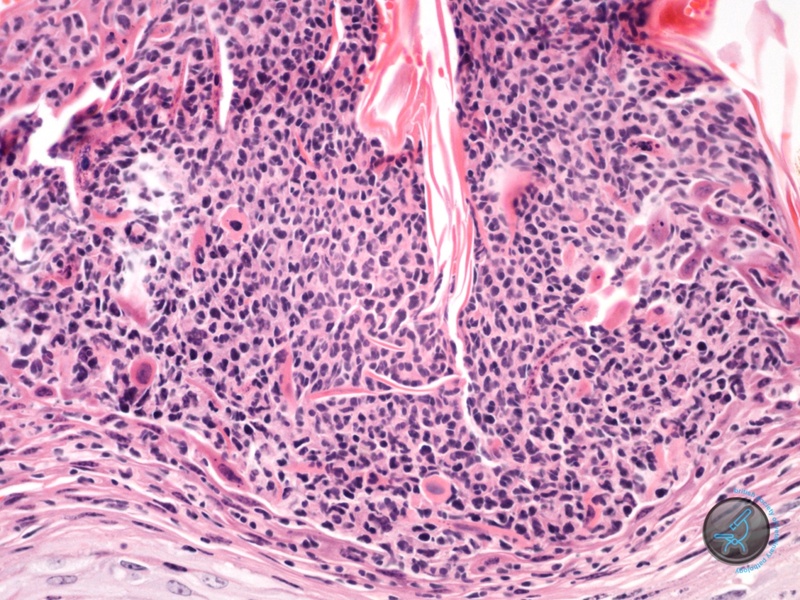 Acantholysis is a feature of some autoimmune disease processes such as pemphigus foliaceus but in an individual of this age, an autoimmune process was unlikely. Inherited syndromes characterised by failure of interkeratinocyte adhesion molecules are described. Familial acantholysis has been reported in Angus calves in New Zealand and was thought to be inherited as an autosomal recessive trait. The acantholysis developed at varying levels in the stratum spinosum. Those calves developed erosions and ulcers in areas subjected to trauma, especially around the lips, tongue, gingiva, carpus, metacarpophalangeal joints and coronets. Some developed partial separation of the hooves. The condition was present at birth or developed within the first two weeks of life. Electronmicroscopy suggested anomalous development of desmosomes and tonofilaments. I have not been able to find a reference to any similar acantholytic condition in the Limousin breed. 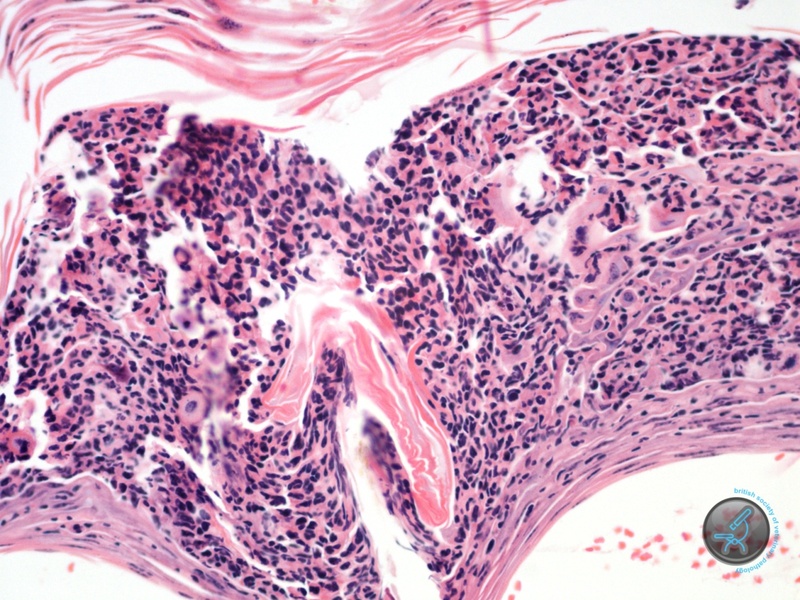 Inherited disease characterised by acantholysis due to defective epithelial adhesion is also described in humans and dogs. In human Darier’s disease the mutation is in the SERCA2 gene coding the SERCA2 calcium pump in the endoplasmic reticulum. In Hailey-Hailey disease the mutated gene is SPCA1 for a calcium pump located in the Golgi apparatus. It is possible that a similar mechanism to that of Darier’s disease occurs in dogs. The histologic picture in dogs and in the Angus calves would appear to show a more extensive pattern of acantholysis than is present in this individual. A congenital defect leading to acantholysis seems probable in this calf, though the expression appears milder than in the inherited conditions described. The cause of the alopoecia is unclear as the follicles appeared normal with normal activity. Scott, DW (1988) Familial Acantholysis, Chapter 11: Congenital and Hereditary Diseases in Large Animal Dermatology. WB Saunders, p 346. Gross TL et al. 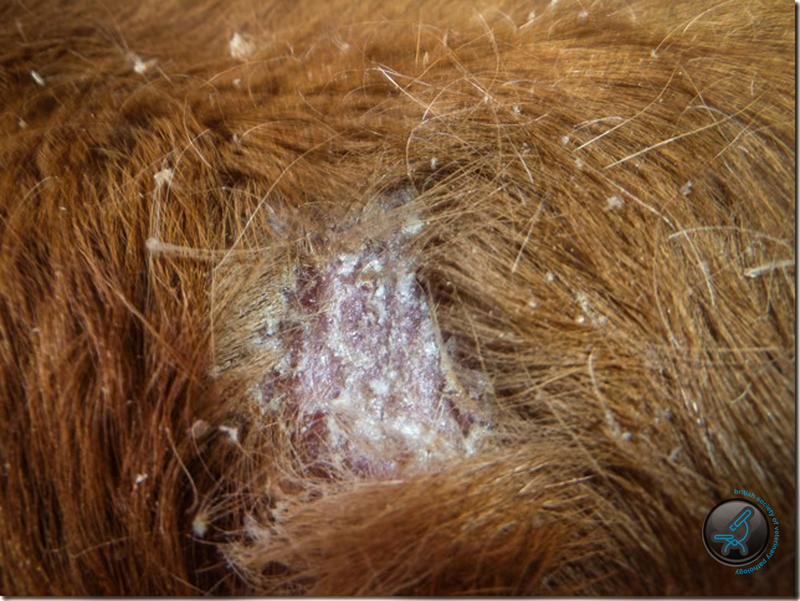 (2005) Canine Darier’s Disease in Skin Diseases of the Dog and Cat: Clinical and Histopathologic Diagnosis. 2nd ed. Blackwell Publishing pp43-45. Nice case and agree with your diagnosis. I presume there is no herd or breeding history available to raise the possiblity of an inherited disorder at this stage? I would still be doing ringworm culture to rule out this mich more common cause of such a presentation despite ehte negaive special stains here.